By Berkshire Manufacturing | August 2nd, 2017 | News. LEE — Highlighting the precision manufacturing and other high-skills job opportunities that are going unfilled across Berkshire County and Western Massachusetts, U.S. Rep. Richard Neal, D-Springfield, stressed Tuesday that more must be done to connect local residents to these positions. The congressman, who toured Lee-based Berkshire Sterile Manufacturing Inc. as part of Startup Day Across America, said the three-year-old biopharmaceutical company “highlights the opportunity for aspiration and achievement” in Western Massachusetts. It, however, also underscores the need for addressing the skills gap and ensuring educational and training opportunities exist for jobs being created in the advanced and precision manufacturing fields, Neal offered. Contending that six million technology-related jobs across the country go unanswered, including between 17,000 and 20,000 precision manufacturing jobs in New England alone, the Springfield Democrat said he believes the government should play some role in helping align Americans with open job opportunities. Neal, who noted that many of those positions require education and skills beyond a high school diploma, offered support for ensuring community colleges and state public higher education institutions design initiatives to better connect students with in-demand jobs. The congressman added that it’s also important to target these programs at individuals who “for whatever reason have fallen outside the mainstream” and may have left school or the workforce. Shawn Kinney, the Berkshire Sterile Manufacturing Inc. CEO, said his company currently employs about 50 people with a range of educational achievements. He, however, noted that just a handful of employees have just a high school diploma. Andrea Wagner, the company’s senior vice president of business development, said Berkshire Sterile Manufacturing Inc. recruits some talent from places outside of Massachusetts, but noted the costs associated with bringing in workers from areas with higher costs of living. Kinney, for example, said although he doesn’t mind paying workers salaries competitive with the region from which they would be moving, that, coupled with moving expenses and recruitment fees the company pays, impede such hirings. The company currently works with Berkshire Community College and other local educational institutions to train local residents, they noted. Acknowledging the company’s challenges, Neal said it’s important for the region to strengthen its job base, draw potential talent from nearby community colleges and work to keep young people with high skills in Western Massachusetts — an area in which he said the economy is largely dependent upon tourism. 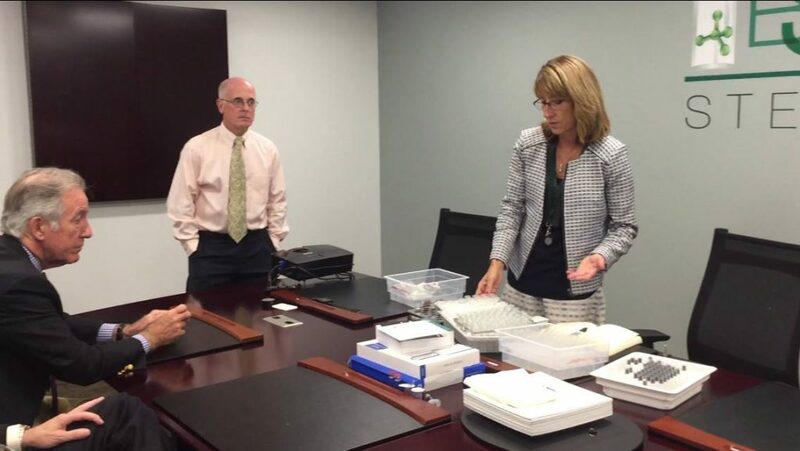 Neal met with Berkshire Sterile Manufacturing Inc. officials and toured the company’s 116,000-square-foot headquarters with state Rep. William “Smitty” Pignatelli, D-Lenox, and state Sen. Adam Hinds, D-Pittsfield, among others.